The Bosch TS2100 Gravity-Rise Wheeled Low-Stance Table Saw Stand was engineered to help users find the ideal working height for their table saws. It provides a lower stance than the Bosch TS2000 but deliver the same great technology that makes setup and take down quicker than ever. The stand is compatible with the Bosch REAXXand 4100 table saws, and it can accommodate many competitive saws from DeWALT®, Makita®, Hitachi®, Craftsman®, Ridgid® and more. It's extremely portable: 8 In. wheels with treaded, solid non-pneumatic tires can handle the toughest terrain with ease and never go flat, and it weighs 52 Lbs. 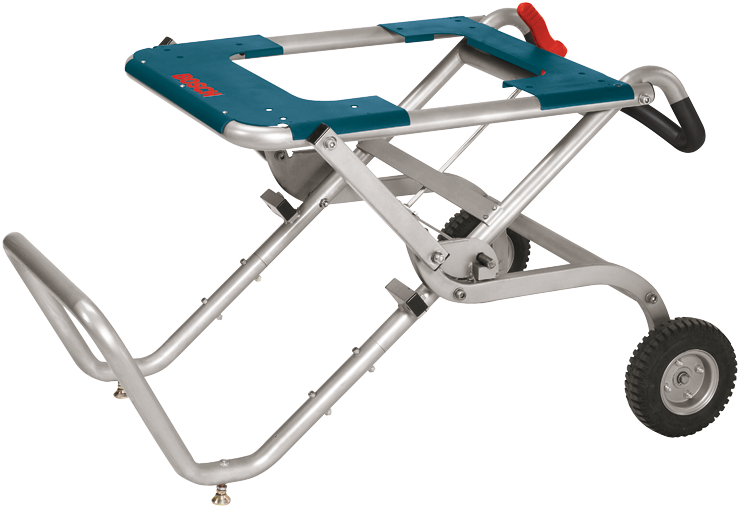 The stand collapses into a dolly, making it easier to transport the saw and the stand together. Its collapsible design minimizes storage space requirements, so transporting this stand to, from, and around the jobsite is a breeze. The durable stand withstand up to 250 Lbs. of downward force, and it has a powder-coat finish for longevity.